Six months ago, Bay, Kendra and I had a silly idea: why not rent a giant house in a beautiful setting, invite a bunch of leaders and masters in our field of work, and go deep with each other? We didn’t really consider how it would go wrong — we made a declaration, committed to creating it, put down a deposit on a $10,000 place, and began inviting people. Incredibly, that weekend got created. It didn’t go wrong, it didn’t fall apart. Ten masters came together and shared their work with each other. It’s been amazing, and challenging, and taxing, and relieving and all of that other stuff. We spent three days sharing with each other all manner of models, approaches, tools and techniques. Sometimes the sharing was riveting, other times I found it boring. Sometimes I felt inspired, sometimes I felt let down. I want to pretend or overcome those moments when I feel bored or let down. I want to make them wrong and protect my peers from seeing them, so that the space is clean and pure and pristine and there’s none of Adam’s stuff in the space. But that’s actually just stepping over the gold that is there. That’s stepping over the opportunity that lies in the space in between. You have a space in between too. We all do. The space in between is all of the stuff that is present in your life, while you live your life. It’s the frustration and resentment you feel towards your partner while you’re actively in a relationship with them. It’s the messy clothes and the way you never seem to get on top of all of your e-mail, while you’re trying to be a professional and run a nice orderly house at home. The space in between includes the collection of reasons you have for not taking on whatever is next. It consists of the reasons why you shouldn’t raise your hand in this moment, why you shouldn’t step forward over the threshold. The reasons why you should delay responding to this e-mail in front of you, and the reasons why you need to get things just a little more in order so that you can really, truly, for-surely, 100% commit to this thing that you say you want to do and have been talking about for the last four years. Predictably, we want to fix the space in between. Our relationship to the space in between is that it’s wrong and shouldn’t be there. “Nonono, you don’t understand. I’m just getting everything handled so that when I commit, I can really be fully committed. I’m actually supporting myself to be even more committed than if I didn’t take care of this stuff first”. We want to clean up the space in between. We want to get all of the tiles of our life fitted perfectly together, so that we don’t need any grout in between, and gunk doesn’t accumulate. But that’s not how life works, and it misses the point of the space in between entirely. Because the space in between is all there really is. 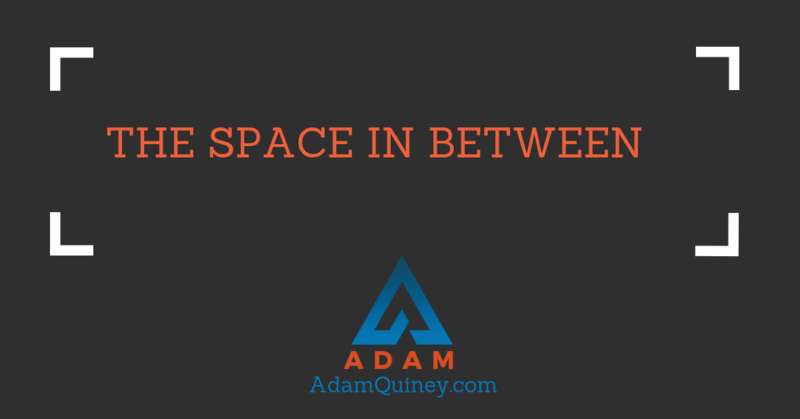 The space in between is the experience of the room while you are training someone. The space in between is how everyone feels after someone storms out of the room — or storms into the room. The space in between is the collection of everything that exists while you’re trying to “get life done”. Life isn’t about getting the space in between “handled”, so you can get back to living. Life is about the space in between. So stop trying to get things in order before you say “Let’s do this”. Life happens in the space in between.